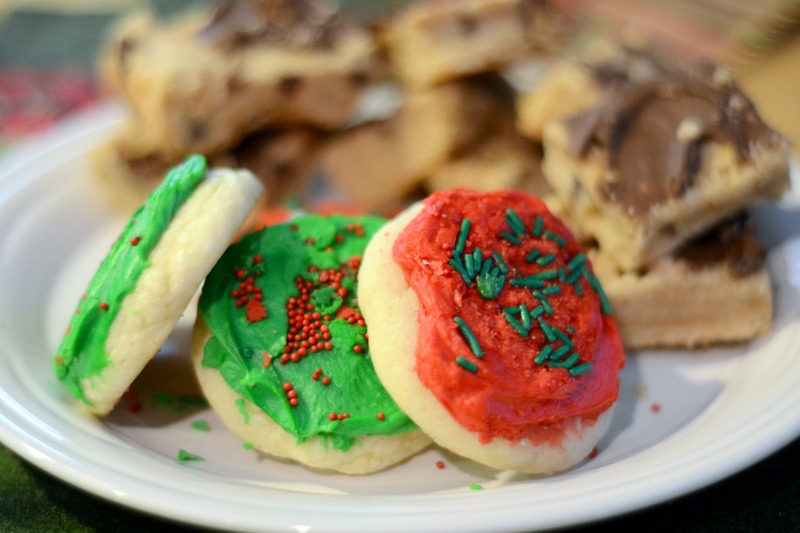 If you are tempted by the soft sugar cookies at the grocery store, try this recipe instead. 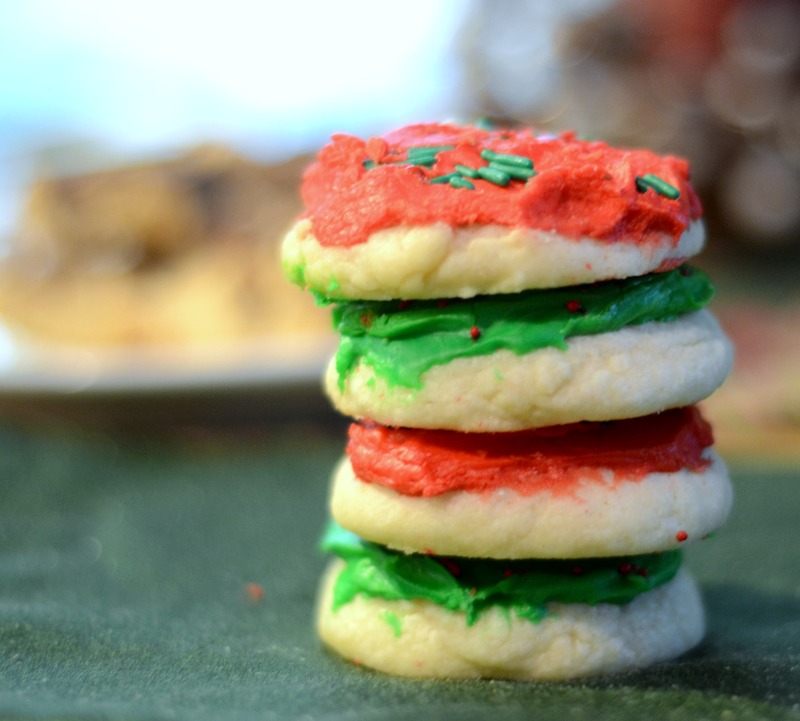 This copy-cat recipe of the Lofthouse Sugar Cookies tastes even better than the ones at the store. I hardly ever buy pre-made sweets at the store but I get tempted every holiday season when the stores start rolling out their soft sugar cookies with the icing and sprinkles. They are one of my weaknesses when it comes to processed baked goods—but I have learned to resist and adapt–by making my own! 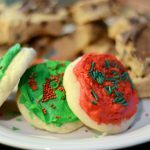 I found this recipe, years ago, on Annie’s Eats (now Annie Everyday) and have kept it in rotation for the various holidays, changing up the frosting colors and the sprinkles to suit the season. I accidentally added peppermint extract instead of vanilla extract–just a tiny amount before I realized what I had done. Not wanting to scrap the whole thing, I decided to see how it would taste—and I thought it made them even better. It was just 1/4 teaspoon of the peppermint extract, which added a hint of something but nothing too strong. This was the first time I had made this recipe and had actually taken the time to sift the powdered sugar for the frosting. This was a very important step and really made the frosting extra good. Don’t skimp on this step. 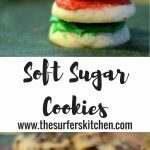 This recipe for soft sugar cookies has been in our family since 2011, when Annie posted them on her blog. Great recipe to have on hand for holidays! Preheat oven to 350 degrees and prepare baking sheets with parchment paper or Slipmats. In a medium bowl combine the flour, baking powder and salt, and whisk together to blend. In the bowl of an electric mixer, combine the butter and sugar and beat together on medium-high speed until soft and fluffy, about 2-3 minutes. Beat in the eggs one at a time, mixing well after each addition and scraping down the bowl as needed. Blend in the vanilla. With the mixer on low speed, add in the dry ingredients mixing just until incorporated and evenly mixed. Cover and chill the dough for 1 hour. Scoop cookie dough and roll into a small ball. Press lightly on it to flatten it slightly. Bake for 10-12 minutes. Do not overbake. To frost the cookies, place the confectioners’ sugar in a medium bowl. Add the melted butter, vanilla, and milk to the bowl and whisk until smooth. Whisk in additional milk as necessary, 1 teaspoon at a time, until you reach your desired consistency. Add food coloring if using. I used a knife to layer the frosting on and then topped with a few sprinkles.